PBA commissioner Willie Marcial (left) and Bobby Ray Parks. MANILA, Philippines — Blackwater team owner Dioceldo Sy said yesterday he won’t trade Bobby Ray Parks who’s set to make his PBA debut in the coming Second Conference and vowed to bounce back from the Elite’s doormat finish in the Philippine Cup with a souped-up roster that could be bannered by former Phoenix Suns’ 6-9 center Gani Lawal. 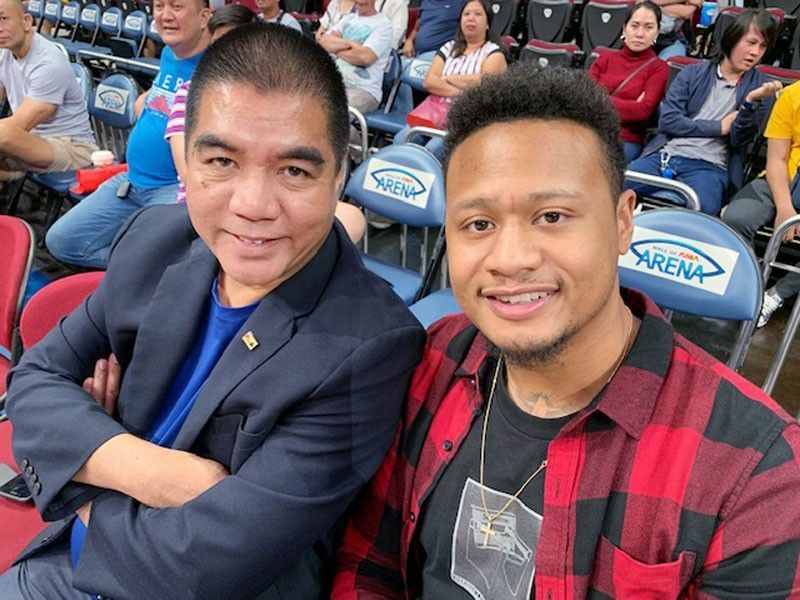 Parks, 26, was at courtside to witness the Phoenix-Alaska playoff game at the MOA Arena last Sunday and got a warm welcome-to-the-PBA embrace from Fuel Masters’ star Calvin Abueva. During the game, PBA commissioner Willie Marcial briefly spoke to Parks who said he still hasn’t signed a contract with Blackwater. “I have no idea,” said Parks when asked about trade rumors speculating a move to Meralco. “Right now, I’m taking time off. I might be away for about a week or two then I’ll get ready for the PBA.” Parks said Blackwater has tendered an offer sheet but mentioned nothing is final as to which team he’ll play for. Under PBA rules, Parks has to sign a contract or else risk a sit-out. Even if Parks declines to sign with Blackwater, the Elite will keep his rights unless he’s traded. But Sy rejected the option of trading Parks. Blackwater started practice at the Reyes Gym yesterday morning and Sy attended to preside in the formal turnover of the head coaching reins to Aris Dumaunahan who has replaced Bong Ramos on an interim basis. Dimaunahan, 41, played eight seasons in the PBA from 2003 to 2011 with Ginebra, Air21, Coca-Cola, Barako Bull and Alaska then joined the Blackwater coaching staff in 2014. Sy said he sees no reason why Dimaunahan can’t follow in the footsteps of Ryan Gregorio, Siot Tanquingcen, Boyet Fernandez, Ato Agustin, Perry Ronquillo, Eric Altamirano, Joel Banal and Chot Reyes who won PBA titles early in their coaching careers. Blackwater team manager Pat Aquino, architect of the NU women’s UAAP streak of 80 straight wins and five consecutive championships, said the coaching staff is assessing the current lineup to determine if there is room to enlist free agents. Assisting Dimaunahan are Junjie Ablan, Benjie Sipin and Tylon Darjuan. PBA legends Bogs Adornado and Romel Adducul are also in the coaching staff. A veteran point guard in the free agents pool is now under consideration for an offer. Aquino said the team is in talks with Lawal of Georgia Tech and 6-9 Greg Smith of Fresno State to play in the Commissioner’s Cup. Lawal, 30, was Phoenix’ second round pick in the 2010 NBA draft and played a game for the Suns in 2010-11, picking up one foul in two minutes. He has played in Poland, China, France, Italy, Latvia, Turkey, Greece and Japan. Lawal, whose father is Nigerian and mother is American, signed contracts with San Antonio and Philadelphia but never played a game for either team. Smith, 28, saw action for Blackwater in 2017, averaging 27.2 points and 22.1 rebounds in 11 games. He earned $3.1 Million with Houston, Dallas and Minnesota in five NBA seasons from 2011-12 to 2015-16. Smith, however, won’t be available to come to Manila until June when the Puerto Rico season ends.